A few years ago – I met my old gym buddy Carson for lunch. I wanted to work on improving my health since leaving the gym the year before, so I told him that I had recently started drinking alkaline water from a water ionizer because I heard a lot about the health benefits that I could gain. 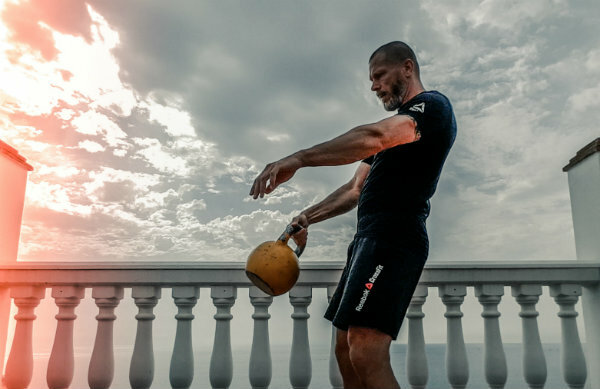 Improve your recovery time after a gruesome workout by drinking alkaline water. Carson has a very active lifestyle and lived alone at the time. He mentioned that he had heard about alkaline water from an article he came across online from one of his favorite health and wellness magazines. I told him how drinking alkaline water from water ionizers is excellent for hydration after doing intense exercises in the gym because the water helps replenish electrolytes lost during exercise. I also shared with him how alkaline water can improve post-exercise recovery so that he won’t feel too dehydrated after rigorous physical activity. Carson then realized that he no longer had to turn to sports drinks, which contain large amounts of sugar and calories, to help him recover after exercising. I then gave him some quick tips about water ionizers to help him choose the right machine for himself. Carson only had one main concern. He lived in a small apartment, so he didn’t have much room in the kitchen to comfortably fit in another home appliance. When shopping for a water ionizer machine – one of the biggest factors to consider is choosing between a counter top or under counter model. So, I recommended an under counter model to Carson that wouldn’t consume countertop space in his tiny kitchen. Both ionizer models provide high-quality alkaline water regardless of where you put the machine in your kitchen – but each model has their own pros and cons to take into consideration during the buying process. Should you choose a countertop or under counter model? Countertop water ionizers are easy to install within 15 to 20 minutes, without having to call a plumber. Just place the ionizer on your kitchen counter and connect it to your faucet. Keep in mind that you MUST place your countertop unit somewhere near a power outlet – as most kitchens do not have power outlets below the sink. Some countertop water ionizers can be connected under the sink – but they still must be placed on the counter. Countertop units work by dispensing any “waste water” through a hose that hangs into the sink. Countertop water ionizers are easy to move from one location to another. Just uninstall the unit from your faucet and reattach it to another faucet. This portability is very helpful if you’re planning to move or visit your vacation home, and you want to take the health benefits of alkaline water with you. 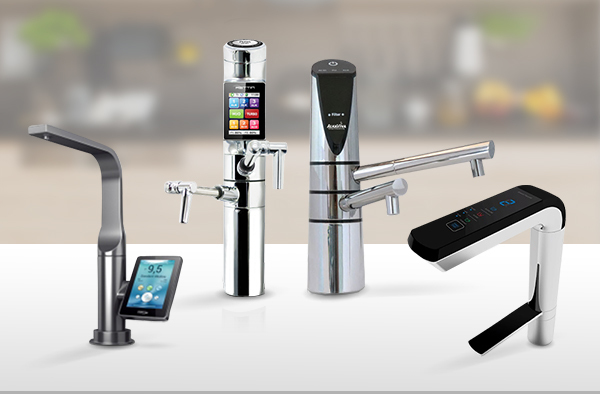 You can choose from a wide selection of different countertop water ionizers – in many shapes, sizes, and colors. Customers have more options to choose from when they want to match their new countertop water ionizer with the overall feel and design of their kitchen. Some countertop water ionizers are big and bulky and can be unappealing to look at all day long while taking up precious counter space. Some countertop units are slim or compact but don’t look good in every kitchen. However, one water ionizer brand, in particular, makes a premium countertop water ionizer that is built with your kitchen in mind, sporting a genuine stainless-steel design that looks amazing in any kitchen. Under counter water ionizers are installed directly under your kitchen sink – which is ideal when you don’t have a lot of kitchen space or you want to hide your ionizer from plain sight. Under counter water ionizers come equipped with two stylish spouts on the unit’s faucet. One faucet dispenses the level of water selected on the control panel – while the other faucet dispenses the waste water. Under counter water ionizers can produce stronger levels of ionized acidic and alkaline water. They work by pushing water up from below the sink, causing additional pressure in the electrolysis chamber to push the water up through the faucet of the unit. Many under counter models can cost $500-$1,000 more than a comparable countertop model. Under counter water ionizers go through additional electronic testing and certifications to meet electronic safety requirements. The faucet’s control panel technology is also compressed to fit into the panel, which can be expensive. The advanced control features are hard to use on many under counter models. The control panel is usually smaller, and any advanced settings may be difficult to navigate. However, some premium under counter water ionizers can do a great job of addressing these “control issues” with a smart touch screen that is fun and easy to navigate. Performing routine maintenance on some under counter models can be challenging. When you need to use a cleaning cartridge or replace your filter, you’ll need to go under your kitchen sink to access the filter area to do so. Some premium under counter water ionizers do make it easier to change the filters under the sink easier than others – so you’ll want to pay attention to how the filter area is accessed with these units. 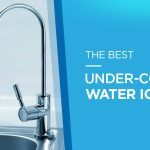 Should I Choose a Counter Top or Under Counter Water Ionizer? Choosing between a countertop and under counter water ionizer really comes down to installation requirements or preference – since neither model compromises on performance or the purity of the water. 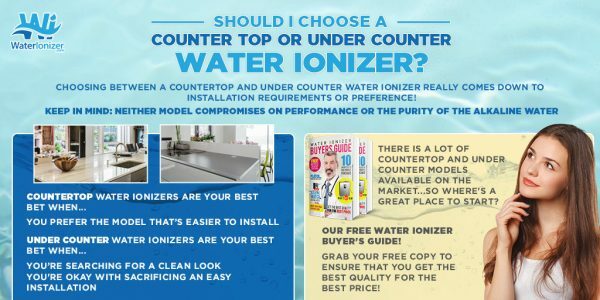 Countertop water ionizers are your best bet if you prefer the model that’s easier to install. Under counter water ionizers are the ideal option when you’re searching for a clean look and okay with sacrificing an easy installation. 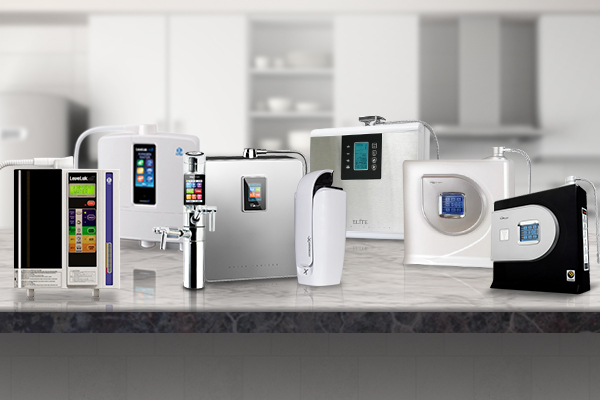 There is a lot of countertop and under counter models available on the market, and a great place to start is our 2019 Editor’s Choice – Tyent’s 11 series water ionizers. Tyent offers premium options for both the countertop and under counter water ionizers. Both the Tyent ACE-11 and Tyent UCE-11 models can create alkaline water that contains molecular hydrogen – while sporting the same smart touchscreen interface, medical-grade 11 plate technology, turbo function, -ORP levels, and other technologically advanced features. Tyent machines also come with a lifetime warranty. HydrogenX is a non-electric ionizer that can create hydrogen water. Currently – HydrogenX only offers a countertop non-electric water ionizer model. Stay tuned for updates. We also like what Evontis and Alkalux have to offer – and you can learn more about their quality machines by reading these water ionizer reviews. 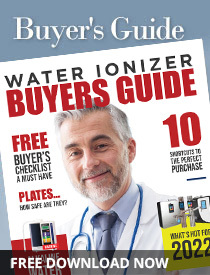 To ensure that you get the best quality for the best price, our FREE Water Ionizer Buyer’s Guide is a quick read that also reveals 10 shortcuts to the best ionizer purchase – so grab your copy before you start shopping around. No matter which alkaline water machine model you choose – you can rest easy knowing that superior health is on the way!